I sold my smallish position in Caldwell. The stock has done quite well given the recent volatility in the market. I would like to put the money to work in some names that have been beaten up. I would like if they did something with the cash on the balance sheet. Maybe they will as soon as I sell my shares. Who knows. 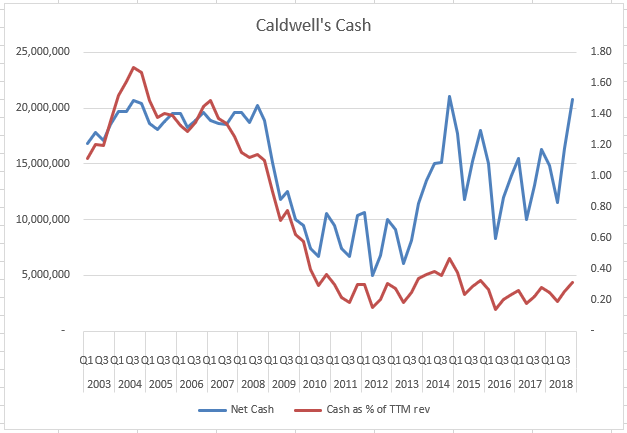 If you look at the cash balance relative to the top line, you can see that it hasn’t moved much in 6 or 7 years despite the cash balance rising. I am critical on management team’s for carrying too much cash on the balance sheet when they have some visibility into the business. When their company or their particular sector is under pressure, I’m less critical of their use of cash.